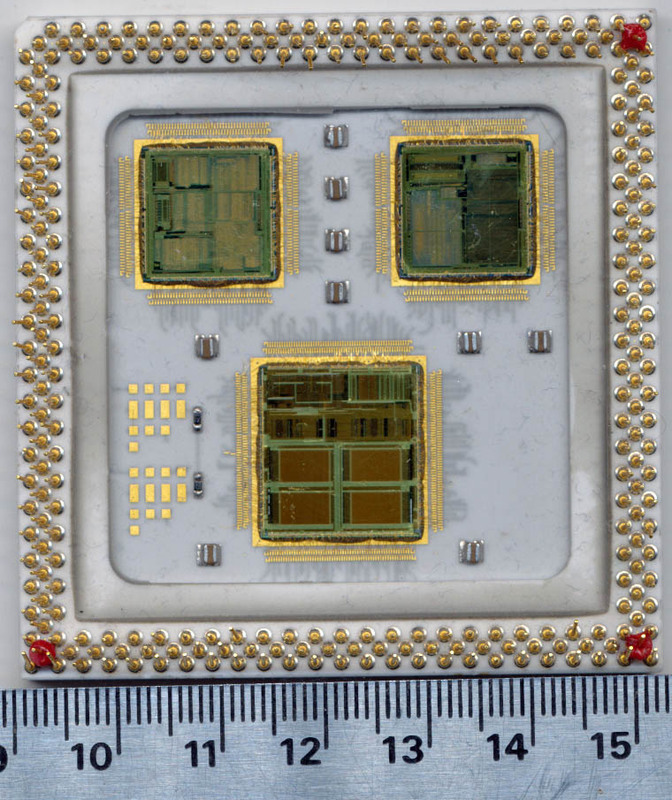 The large chip at the bottom is most likely the CAMMU–not only because of its size (being largely SRAM and fusing off a block/TLB entry being practical, yield could be better) but also having four large regular blocks (each C100 CAMMU had two such blocks and there were separate I and D CAMMUs). 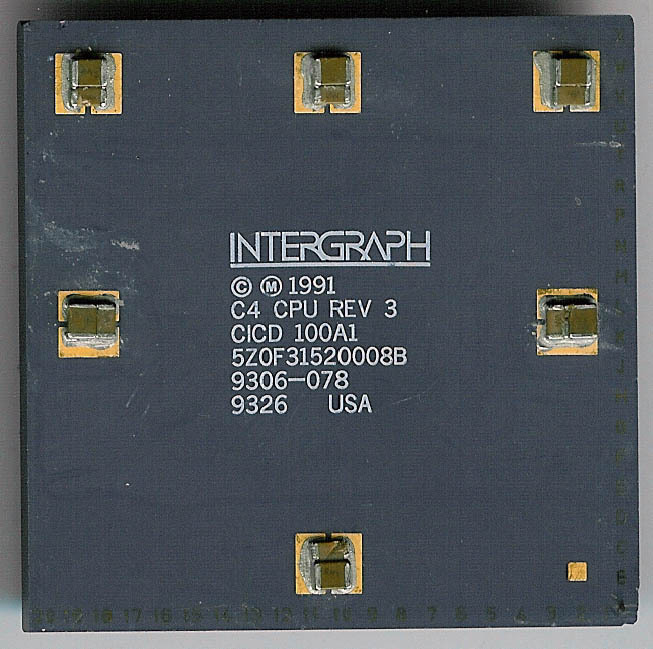 The top right chip looks very similar to the FPU section in the C100 (Figure 7, pdf page 23, “The Fairchild CLIPPER: Instruction Set Architecture and Processor Implementation”) and the relative complexity of the top left chip seems to match much better the instruction and integer processing portions of the C100 (same die image/floorplan source). Thank you for the info, that does make sense. 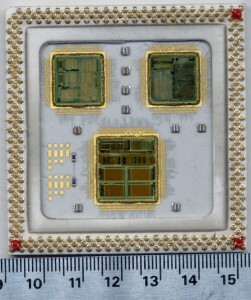 The image here (http://www.cpu-collection.de/showimage.php?i=Intergraph_Clipper-C4_card&s=big&tb=1&r=0 ) confirms that the bigger chip is the CAMMU and if the shown surface of your image would be the hidden surface of that image–logic/’pins’ close to the board–then my identification of the FPU would be correct (assuming a board layout with the chips would be the same as a MCM layout), otherwise the CPU and FPU are reversed. I can’t remember who on out team designed this, but I do remember seeing the design in our MCM Engineer product. At the time we did allot of fabrication Coors Ceramics. So this is the slower C4, as we had one running at 100mhz with a cooling port in the ceramic, in the middle. 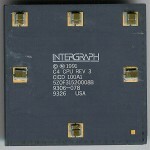 I worked for Intergraph’s Advanced Processor Division (APD) in Palo Alto, CA for a couple of years. I was hired to work on the simulation and verification of an ECL version of a Clipper CPU powered computer implemented in Fujitsu ECL gate arrays (a whole bunch of them). The power consumption was off-the-charts and required liquid cooling. A large radiator was used that had to be mounted under the floor in order to duct the heat away. There was a large 10 Kilowatt (I believe) power supply. The cooling required several gallons of Fluorinert which was pumped in between the boards and over the chips, then through the radiator which had two 12″ fans. This is very unlike the liquid cooling used these days in high powered PCs because the chips and boards were actually bathed in the coolant itself. The boards were mounted inside a large Plexiglas case for show. The advancement of CMOS CPUs was rapidly catching and eventually surpassing the 300 MHz (if my memory serves me correctly) clock frequency of the ECL behemoth. The project was cancelled because of this. My facts and figures may be incorrect because this was all happening in the 1989/1990 time frame. BTW I was looking at doing an SBC with the Clipper C300 (IIRC, I don’t think it was the C400, I still have all the technical info somewhere) but the 486 came out just then and that was that for Risc chips in a lot of areas (also O/S hassles didn’t help, more so as the 486 caused Risc versions of NT to disappear). I still have some A0 step 486s and they also needed a lot of cooling – too much to ship a product, due to chip issues that were fixed in the next versions; also not all the instruction set executed incorrectly, you could boot DOS but a Dir listing would look a bit screwy.